Most of the music for The Evil Dead was composed by Detroit native Joe LoDuca, the first of a number of film & TV commissions through his life. The exception is the Jazz/Ragtime track that plays during the cellar 'blood-flood' scene and, over the end credits. For more information on that track see further down the page. Before contacting Joe, Sam used a temporary score assembled from cues taken from other movies, to help with the editing process and give Joe a feel for what they wanted. A young man who made films for the state of Michigan traffic department put them in contact with each other, although neither Sam nor Joe can remember his name. Sam, Bruce & Rob interviewed other composers but when Joe explained to them the kind of score he wanted to compose, they gave him the commission. Joe hired five string players, which he doubled and sometimes tripled, adding percussion instruments and keyboard synthesiser effects, to achieve a full orchestral sound. Such was the popularity of these synthesiser sounds that after the success of the film many came with an added feature called 'Evil Dead sound' based on the combinations created by Joe. 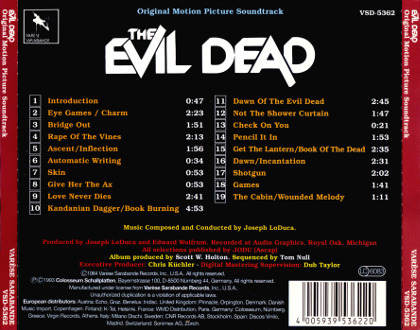 While all the versions of track seven on The Evil Dead's three soundtrack CDs (titled 'Give me some more skin' on the Japanese release or just 'Skin' on the US release) are about fifty-five seconds long, the US version starts to fade out around the forty second mark, while both the Japanese versions play in full right up to the end of the track roughly giving an extra twelve seconds of music. Having compared the versions of each track, this is the only difference which can be found across all 126 tracks over the eight CDs in the five trilogy releases listed above (with the obvious exception of the slightly differing amount of silence which plays before and after each track). You can buy the official Varese Sarabande 1993 US CD & LP soundtrack at Amazon.com and Amazon.co.uk as well as Ebay, although many fans will already know that this release does not include all the music used in the film. The retail version runs at 38m 52s, and while missing some cues, there are further tracks included which were not used in the film at all, and everything out of sequence. This was a project to edit a complete version of the soundtrack running in chronological order. What was missing from the retail score was added for the most part using the left & right rear channels from the 5.1 movie audio mix on the 2010 US Anchor Bay Blu-ray. The rear channels of a 5.1 mix are usually free of speech and many of the sound effects found in the front channels. In addition to this a couple of other tracks were used, including some sound effects to replicate audio effects heard in the movie. The finished version has 54 tracks and runs at 41m 01s, the most complete version of the score to date, containing every last second of music used. Of these 54 tracks, 21 (17m 48s) have been mixed using only the retail CD, 25 (12m 56s) mixed using either the Blu-Ray audio or other sources, and 8 (10m 08s) are a combination of the two. It does have odd speech & sound effects, but this is currently the only option. Putting the soundtrack up for download would raise copyright issues, but you can listen to a stream-only version through the media player below. Please note; We don't wish to tread on anyone's toes, simply to allow fans to listen to material they can't officially buy. If there are still any copyright holders out there would rather their audio was not included here, please send over an email, and it'll be immediately removed. When I met Sam Raimi at the Cannes Film Festival in May of 1982, my first thought was that this fellow was one of three things: a busboy, a runaway American high school student, or a genius. He wasn't a busboy, and Raimi finished high school some time ago, although he has the sort of ageless sophomore looks that are going to keep bartender's asking to see his driver's license or state liquor card until he's at least thirty-five. That he is a genius is yet unproven; that he has made the most ferociously original horror film of 1982 seems to me beyond doubt. Raimi, a Michigan native now quartered near Detroit, was twenty when he directed and wrote EVIL DEAD. (He was also one of the cameramen, assisted in the first half by Tim Philo.) His producer, Rob Tapert, was twenty-six. The gruesome special effects were achieved in tandem by Tom Sullivan, twenty-four, and Bart Pierce, who is all of thirty. The five stars were college kids. The film was shot in sixteen millimetre and blown up to thirty-five for theatrical release. The resulting effect is grainy but oddly apt; the film has a weirdly convincing documentary look that no one has seen since George Romero's NIGHT OF THE LIVING DEAD, a film Raimi admits was a strong influence. And it doesn't sound like much. Well, neither does Hansel and Gretel or Bluebeard in the hands of an untalented teller. What Raimi achieves in EVIL DEAD is a black rainbow of horror. The jazz/ragtime track that plays during Ash's cellar 'blood-flood' scene, and over the end credits has long been a source of debate. I can finally lay that one to rest. Complete credit for this goes to both DJSmokingJam aka Evil James who found some library details of this track (after alot of searching) and to Chris Stavrakis who filled in the rest of the track's details. It's a piece of music called 'Charleston' composed by Erik Markman (aka, Ib Glindemann) This track is available to licence professionally as a piece of library music from www.dittybase.com, entitled 'Jazz Traditional - Charleston'. Unfortunately, it's very expensive to do so. Incidentally This track was also used in the 1982 George Romero film; Creepshow, as one of the jazz tracks played by the jukebox in the 'They're Creeping Up On You' segment. The shooting script lists the song that Shelly & Scott sing while they're driving to the cabin as an "old 'Baby Moses And The Thrillers' song". This isn't quite the case. Contrary to inaccurate information previously hosted here (now corrected as of January 2019), the song was actually called Word Back Here; originally written years before in 1972 by Bruce Reynolds, about his long-time friend Jerry Prager. The song is written from Bruce's perspective (who at the time was in Paris), about Jerry and his friend Nancy; a girl with which Jerry hitch-hiked to Prince Edward Island back in 1972. Jerry in turn, later taught it to Sam Raimi during a canoe trip he guided with Sam as his assistant while they were both at Camp Tamakwa. Sam later used this song in The Evil Dead without the knowledge or permission of Bruce or Jerry. It was only in 2019, nearly forty years later, that Bruce and Jerry discovered this and got in contact with this site. Sam taught the lyrics to the actors while they sat in their positions in the car on location at the beginning of the first day of shooting down in Tennessee in 1979. No recording of this song has ever been released, so it isn't available to buy, but you can see a transcription of the lyrics in full below. It's worth adding that Sam sings this tune to himself in his role as Randy the butcher in Scott Spiegel's film Intruder (at PAL running time 00:47:50), and The Evil Dead's cast sing a few lines towards the end of the Unconventional documentary on disc 3 of the 2007 US R1 Anchor Bay The Evil Dead Ultimate Edition DVD. well I haven't heard a word from you. you should have heard that poor girl cry. don't you lie with your eyes facing home? and it wouldn't break your arm in two. 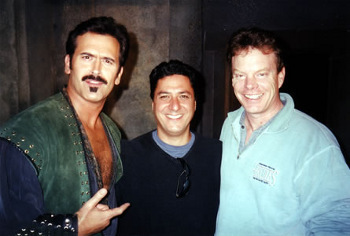 Just as an aside, 'Baby Moses and the Thrillers' was the name for the various players in the musical jam sessions in Sam's basement, which usually included Rob Tapert & Ivan Raimi because they could both play the guitar, along with Josh Becker, Scott Speigel or Bruce Campbell occasionally sitting in on background vocals. Their biggest hit (a hit simply because Sam said so) was Eight Mile Line, which was the same song performed by Sam, Bruce & Greg Nicotero at the Evil Dead II talent contest.